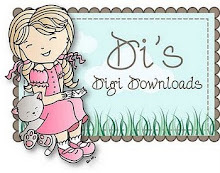 Time for a new House Mouse and Friends Monday Challenge. Recently, our fellow teammate, Paula gave birth to a beautiful baby boy. We are so very excited for Paula and her family. is I am Thankful for babies. Awww, sweet Happy Hopper baby. I used a onsie pattern I have had forever. 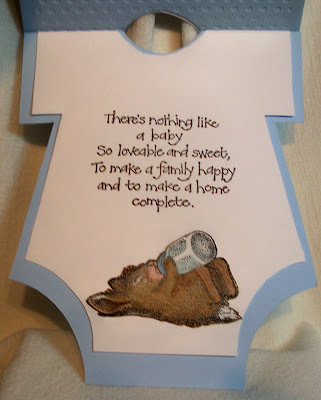 This sweet little happy hopper baby was used on the front of the onsie. were used on the front. The onsie was run through the swiss dot embossing folder. I used a small whole punch to punch circles to add to the arm and leg opendings. Small white buttons were used on the bottom. Colored with Copics. This is the inside of the card. Another little Happy Hopper..shhh almost asleep. before she sees it here. We are so excited about this challenge, and the design team has come up with some wonderful cards/projects to celebrate Nathan's birth. 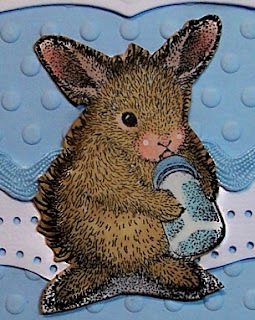 Hop on over to the House Mouse and Friends Monday Challenge blog to check them out and get some inspiration, then ink up those House Mouse, Gruffie or Happy Hopper Stamps and help us celebrate babies. We can't wait to see what you come up with! So sweet and creative. Love it Sue. You are just so darn smart!!! This is gorgeous Sue. I love the design and the cute image. It's nice to see that wonderful photo oh Paula with Nathan again too. hee hee Sue this is totally CUTE! I love onsies! The collar on this is fabulous. Beautiful and so very sweet. ahhhhhhhhh what a cute one Sue. very beautiful done and made. wonderful new cards dear Sue! and this little boy ist so sweet..thank you for the nice photo! 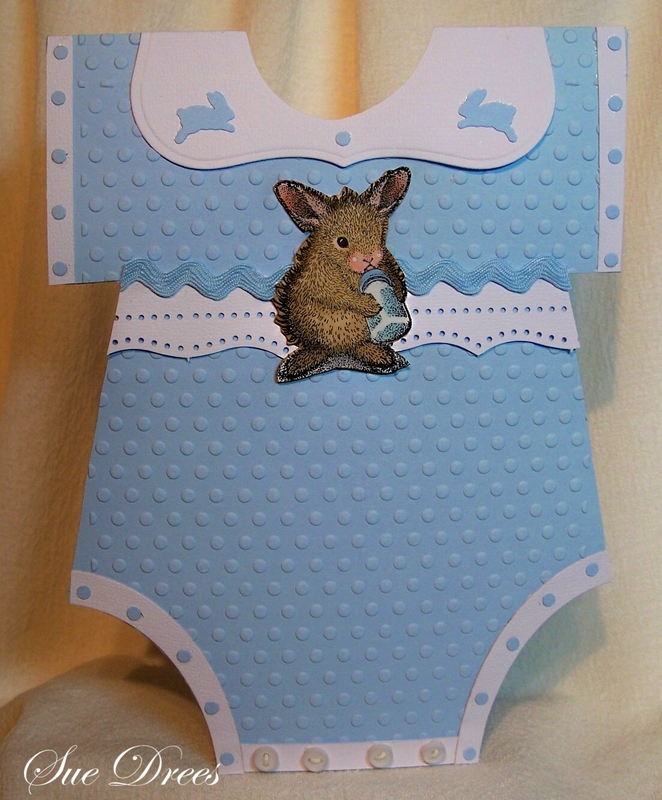 I love the shape of your card, Sue...the colours and images are so perfect for a baby boy. Wowzer cute baby creation Sue never heard of an onsie before we call them Romper suits..lol such a stunning design & those sweet images & verse all to cute..bet Paula loves it. Wat een mooi rompertje is dit zeg. 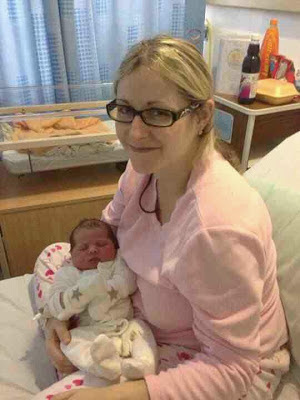 Paula and baby look great!! 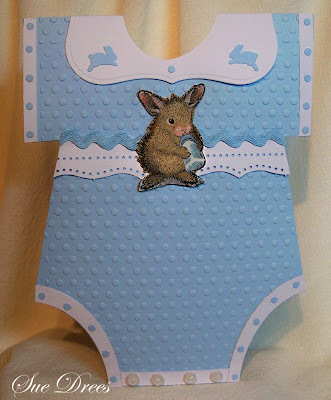 Your onesie card is absolutely darling!! Congrats to Paula!! One of the cutest baby cards I've ever seen. Just love it! Sue, you are a genius! This is simply adorable. Paula will love it as will the rest of her family. Very, very creative. 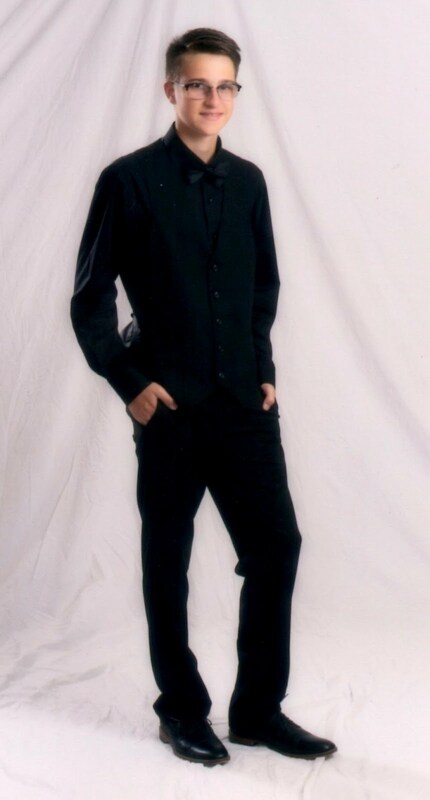 Those buttons on the bottom really make it seem lifelike. A total winner. Happy Thanksgiving. So precious -- a lovely keepsake card. A gorgeous creation Sue, I love your design and details are fabulous - brilliant embossing and beautifully coloured little images. Fabulous baby creation, I adore your image, It's so sweet. Love the design too. What a sweet card Sue. Love the cute image,the onesie shaped card base and the fabulous verse inside! Just fabulous!